Hello. I am Grandma Denise. I had been a homeschool mom for 14 years. I am a Sunday School teacher going on 23 years. I have gathered a ton of resources over the years that I would like to share with you. Now that I am a grandma, I know I can recycle these resources to make bonding with my grandbabies lots of fun. Join me! 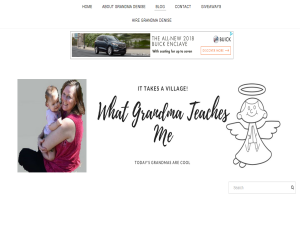 This what your What Grandma Teaches Me Blog Ad will look like to visitors! Of course you will want to use keywords and ad targeting to get the most out of your ad campaign! So purchase an ad space today before there all gone! If you are the owner of What Grandma Teaches Me, or someone who enjoys this blog why not upgrade it to a Featured Listing or Permanent Listing?